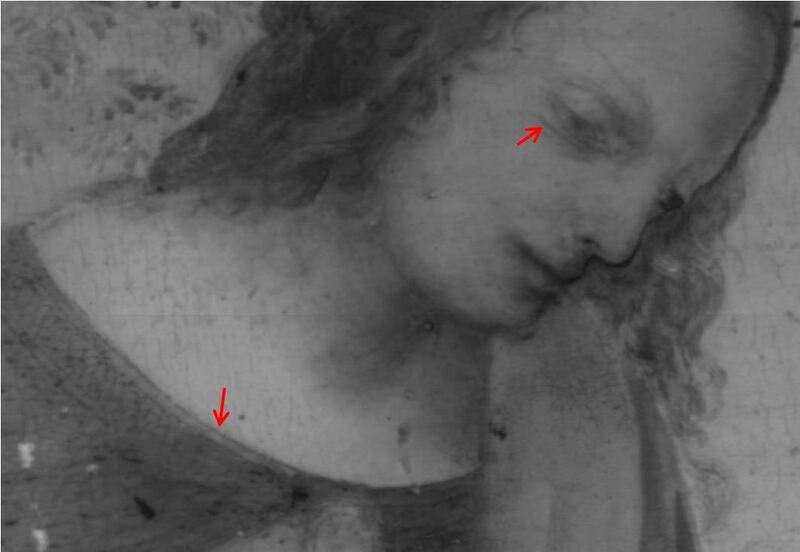 A considerable amount of work has been done on the paintings of Leonardo’s followers and the National Gallery, London have published infrared reflectograms of paintings by several contemporary artists, including Marco d’Oggione’s Virgin and Child. 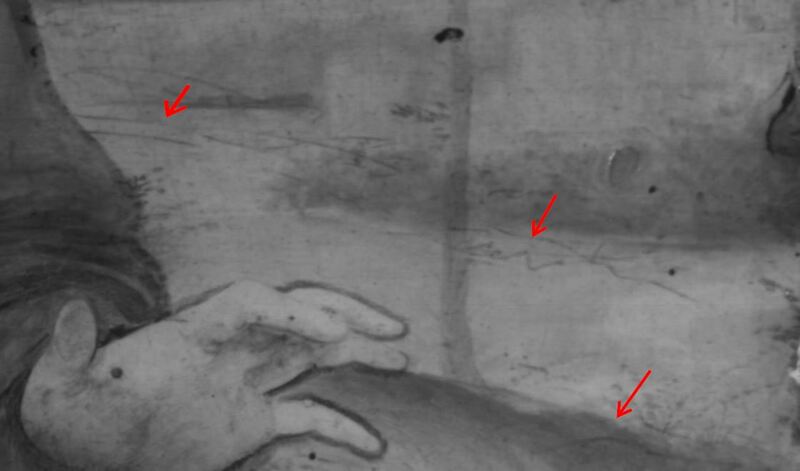 When examined in infrared, most of these paintings did reveal a liquid underdrawing but this was not always the case as, although d’Oggione’s Virgin and Child is underdrawn, ‘nothing that could be firmly identified as underdrawing could be seen in the head, clothes or ledge’ of his Portrait of a Man aged 20. Similarly, no drawing was identified on Giovanni Antonio Boltraffio’s Virgin and Child ‘due to poor penetration of the paint’ caused by the Leonardesque use of dark underpaint. The general absence of drawing in the painting examined does not seem to be due to a problem with penetration since some marks and pentimenti are apparent in the reflectogram. Instead, the absence of detectable drawing is probably due to the artist closely following the initial design. 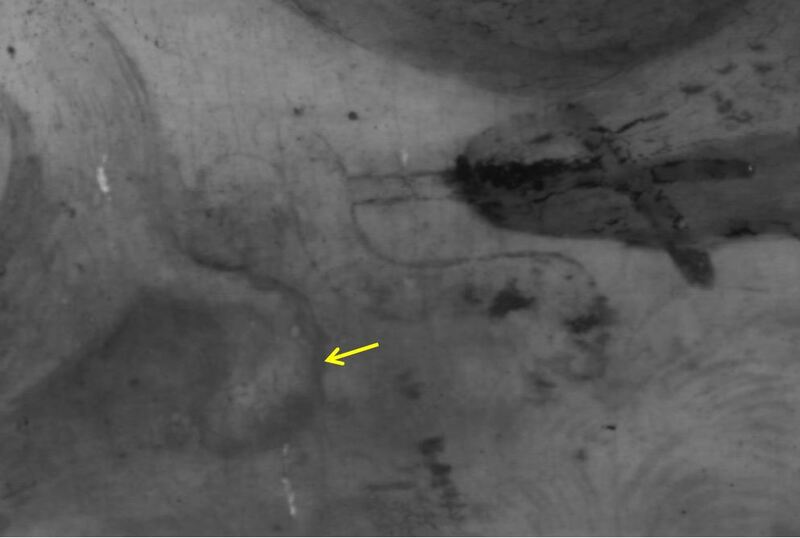 Although, it is also possible that the artist employed a drawing medium that does not register in infrared, for example an iron-gall ink. The composition is clearly planned and the figures are reserved (as can be seen from John the Baptist’s head against the dark foliage background). There are some fine lines in the landscape at the right which do not correspond exactly to the painted forms. These lines could represent underdrawing but should be checked carefully against the painting to ensure they are not apparent at the surface. Similarly, the contour of the Virgin’s neckline does not seem to correspond exactly to the paint and could be underdrawn. There is also a fine line marking the edge of the cloak lining which should be compared to the paint as it has the appearance of drawing. The absence of any significant pentimenti in this composition would seem to support the idea that this panel is a copy of a lost composition by Leonardo da Vinci. It is also interesting to note that the position of the Virgin’s head resembles the initial, underdrawn design on the National Gallery, London’s The Virgin of the Rocks, which was executed in a broadly brushed, fluid, brown-black medium. IRR detail of the landscape at the right showing sketchy lines which do not appear to correspond to the painted design. 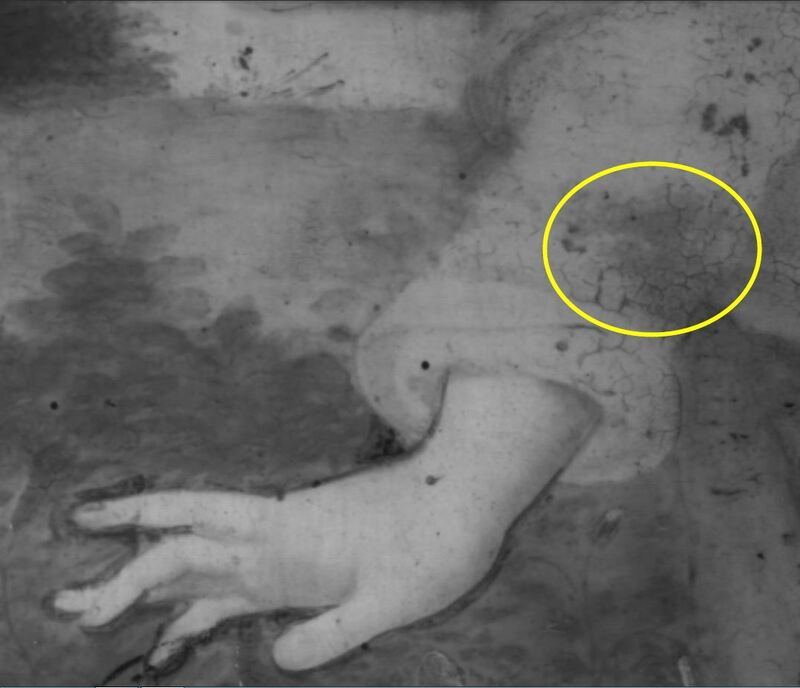 Heavy dark marks around the Virgin’s hand are likely to be the result of retouching in this area. IRR detail of the cloak lining across the Virgin’s chest. This line appears quite fine and may be drawn. The brooch at the neckline should also be checked against the painting for possible drawing. IRR detail of the Virgin showing possible drawn lines at the neckline. The lines in the eye may also be drawn but correspond closely to the paint. Again, the profile appears to have been reinforced with retouching. The most notable feature of the reflectogram is the change to the lamb’s tail and St. John’s cross. The initial, drawn tail is much longer than the final painted version and a cross is apparent below the falling drapery of the Virgin. For some reason the cross was eliminated from the final composition. 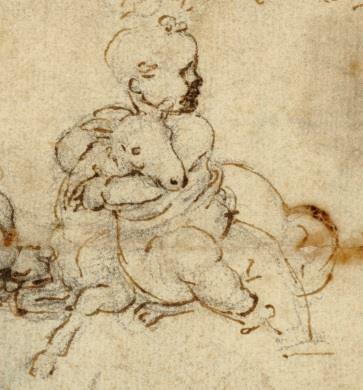 Similar long lambs’ tails can be seen in Leonardo’s drawings of the subject (for example the Getty drawing below). IRR detail of the foreground showing the earlier design for a longer lamb’s tail and cross, which was subsequently covered with the Virgin’s drapery. The yellow arrow indicates the painted tail of the final version. IRR detail of the foreground showing the earlier design for a longer lamb’s tail and cross, which was subsequently It is interesting to note that, despite its worn condition, there does not seem to be any evidence of this pentimento in the Ashmolean version of this picture. There are documented instances where studio assistants copy their master’s work during the painting process and, as such, the inclusion of this single pentimento might link the picture more closely to the prototype than other versions. with the Virgin’s drapery. The yellow arrow indicates the painted tail of the final version. Studio of Leonardo da Vinci (1452 - 1519), The Virgin and Child with the young St John the Baptist © 2011 University of Oxford - Ashmolean Museum. The reflectogram also shows a dark shape in the Virgin’s right sleeve, which might indicate another, more minor pentimento. IRR detail of the Virgin’s right hand/sleeve. The dark shape in the sleeve might indicate a pentimento - perhaps the landscape encroaching into the reserve for her figure. The fingers appear to have been reinforced at a later stage rather than repositioned by the artist. The reflectogram also gives some insight into the condition of the panel with small, isolated losses showing up as white and retouchings black (there are many small retouched losses in the Virgin’s costume). 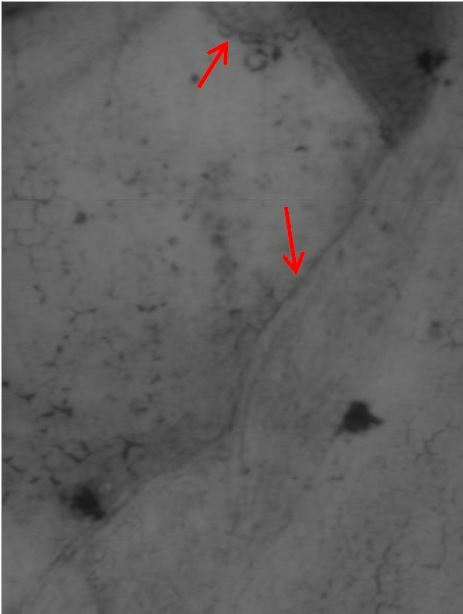 Some damage is apparent at the corners and extends up the vertical edge at the bottom right. Some vertical splits are also visible running down from the top edge at the left. The folds of the blue cloak appear to have been reinforced with retouching as does the contour of the Virgin’s face and hands (see above images). The cangiante drapery of the Christ child also appears to have been strengthened as does his chest, raised right hand and the bird. Reflectography also helps to understand the design of the Virgin’s cloak, whose lining was probably a purplish red which has now discoloured and is difficult to distinguish from the blue. 7. Spring, M., Mazzotta, A., Roy, A., Billinge, R., Peggie, D. ‘Painting Practice in Milan in the 1490s: The Influence of Leonardo’. National Gallery Technical Bulletin Vol 32, pp 78–112, p90. 8. Spring, M., Mazzotta, A., Roy, A., Billinge, R., Peggie, D. ‘Painting Practice in Milan in the 1490s: The Influence of Leonardo’. National Gallery Technical Bulletin Vol 32, pp 78–112, p96. 12. 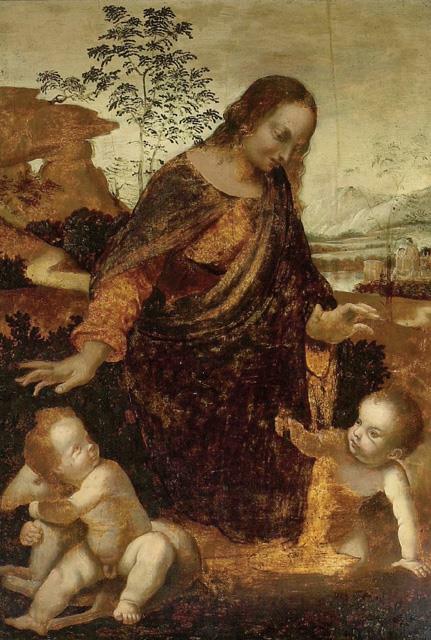 Keith, L., Roy, A., Morrison, R., Schade, P. ‘Leonardo da Vinci’s “Virgin of the Rocks”: Treatment, Technique and Display’. National Gallery Technical Bulletin Vol 32, pp 32–56, p43. 1. Dunkerton, J. ‘Leonardo in Verrocchio’s Workshop: Re-examining the Technical Evidence’. National Gallery Technical Bulletin Vol 32, pp 4–31. Keith, L., Roy, A., Morrison, R., Schade, P. ‘Leonardo da Vinci’s “Virgin of the Rocks”: Treatment, Technique and Display’. National Gallery Technical Bulletin Vol 32, pp 32–56. 2. Spring, M., Mazzotta, A., Roy, A., Billinge, R., Peggie, D. ‘Painting Practice in Milan in the 1490s: The Influence of Leonardo’. National Gallery Technical Bulletin Vol 32, pp 78–112.